Summer was drawing nearer, and so this issue of DC SUPER-STARS arrived at the 7-11, touted as a summer spectacular. I can’t say that I was the biggest Aquaman fan–I knew him, of course, from Super-Friends and his appearances in JUSTICE LEAGUE OF AMERICA. But none of those appearances had really driven me to seek out his individual adventures. But this big reprint package and maybe the nice Jim Aparo cover compelled me to take the leap in this instance. The big attraction of Aquaman during the period these stories were culled from was the artwork of Nick Cardy, who had more recently been DC’s designated super hero cover artist right when I started reading comics. Cardy is one of the underacknowledged greats of the history of comics, his work being simultaneously animated and realistic. This first story seems to show Cardy struggling with the then-recent change in the original art size that DC had instituted–most of the artists of the Silver Age had some growing pains when this transition took place. 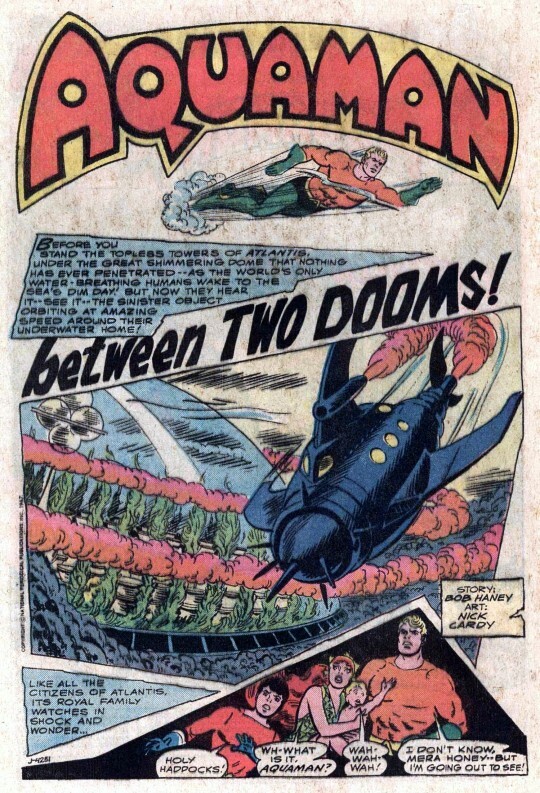 The story opens with a mysterious undersea vessel approaching the outskirts of Atlantis, where Aquaman rules. Leaving Aqualad and Mera, his wife, behind, Aquaman sorties out to make contact with the craft and determine its intentions. 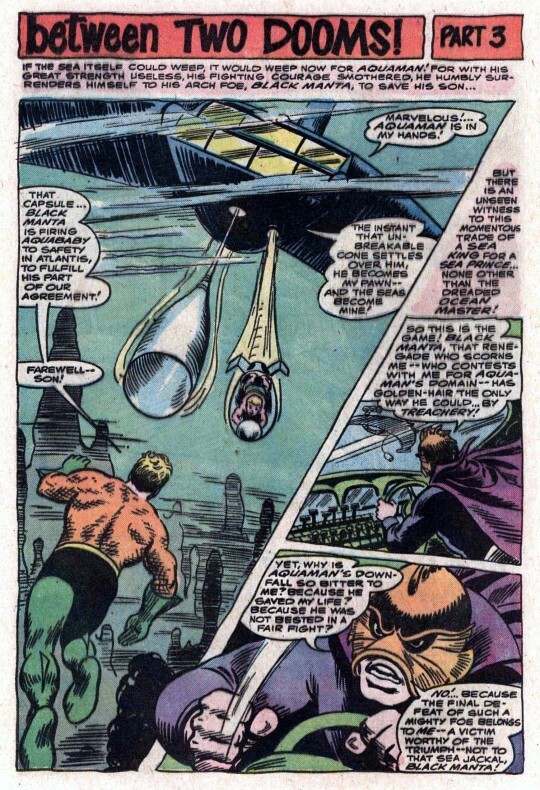 But it’s not long before he’s magnetized to the hull of the craft bio-magnetically, an easy target for the animalistic Manta-Men who serve as the shock troops for his old nemesis Black Manta. Black Manta, it must be said, had one of the coolest looks in villaindom–a really great design. He’s out for revenge against Atlantis, and while he can’t penetrate its protective done, he uses a Photon Transducer Ray to make the water inside the dome boil. The Atlanteans pump all of the water out in order to escape being boiled to death, but like Aquaman they can only survive without H2O for an hour. Meanwhile, Mera uses her Hard-Water powers (also cool) to free Aquaman from Manta’s decoy ship. 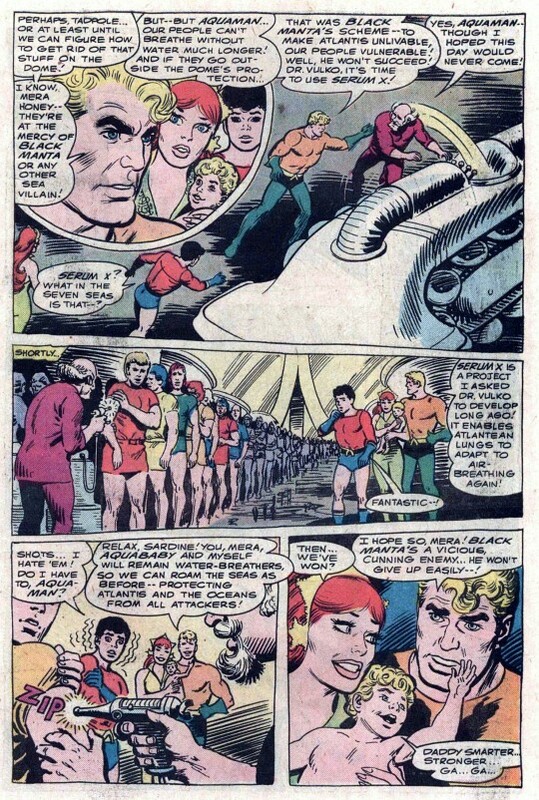 Manta offers to trade Aquababy’s life for Aquaman’s, a deal the Sea King reluctantly agrees to. But the situation is made even more precarious with the arrival of the Ocean Master, who is secretly Aquaman’s half-brother. 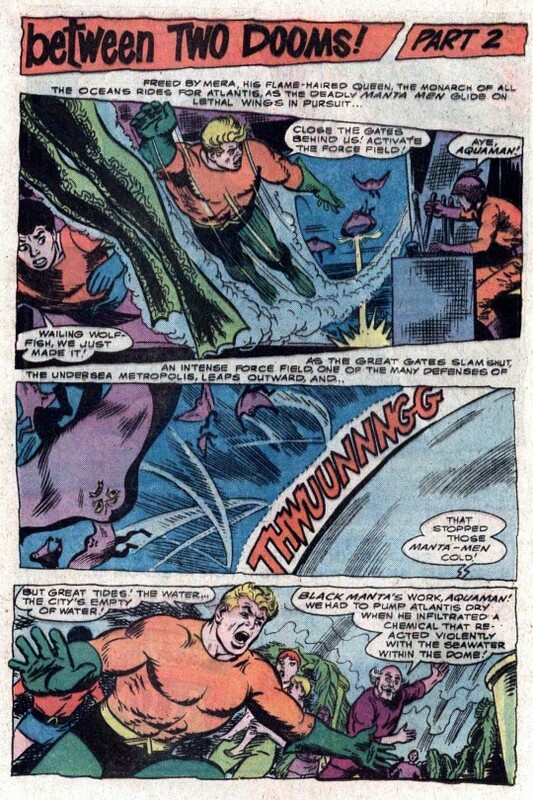 He can’t stand the notion that Black Manta will destroy Aquaman where he failed, so the Ocean Master snatches up Aquababy himself, forcing a showdown between the two villains. 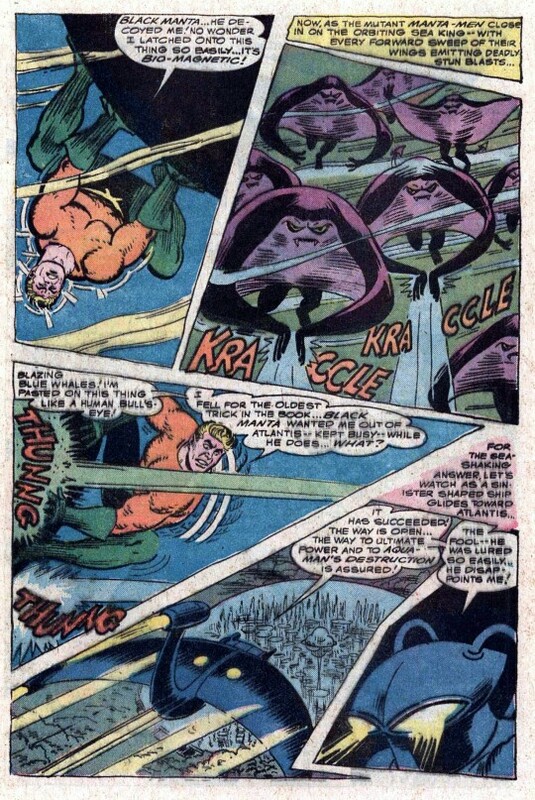 As he has for most of this story so far, Aquaman sits things out trapped this time in Black Manta’s capture-bubble while the two aquatic villains spar for supremacy. 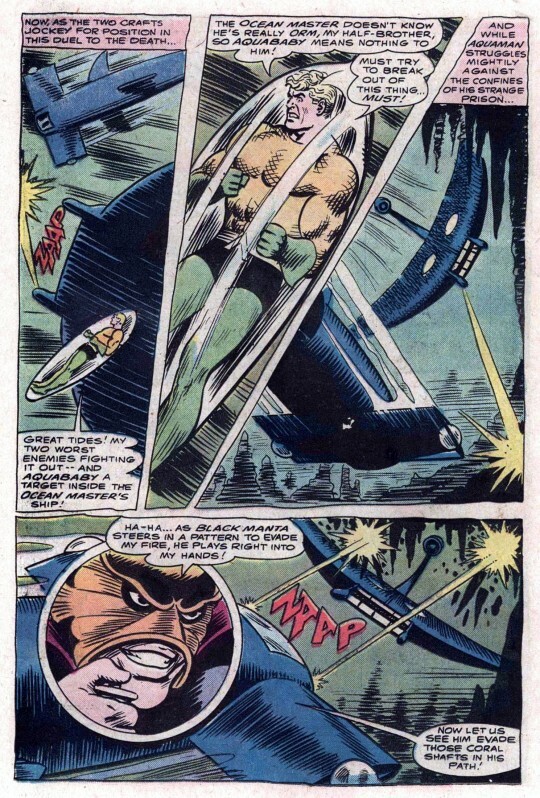 They destroy one another’s’ submarines–and Aquababy defends Ocean Master’s life with his hard-water abilities when the villain is stunned by the blast, easy pickings for the Manta-Men. The Ocean Master returns the favor, reuniting Aquababy with his useless father who could not have been any less a factor in this story. The relationships at play were pretty cool, but Aquaman himself was completely ineffectual. 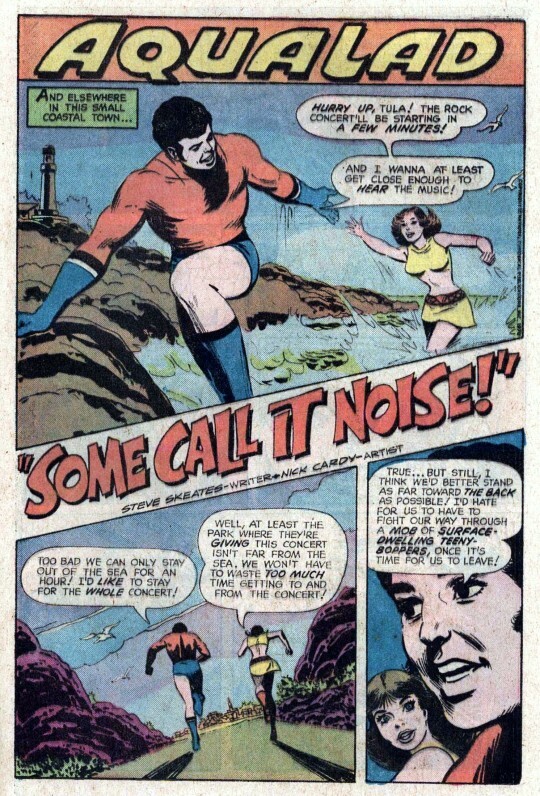 After a double-page feature showcasing Aquaman’s rather bizarre and off-putting rogue’s gallery, the issue segues into an Aqualad story taken from the pages of TEEN TITANS, in which Garth and Aquagirl run into trouble while attempting to take in a rock concert, as all the groovy kids were doing in 1971. But a brain hormone given to a terminally ill patient grants him superhuman strength and a sensitivity to sound–which drives him to escape the hospital and attack the concert. 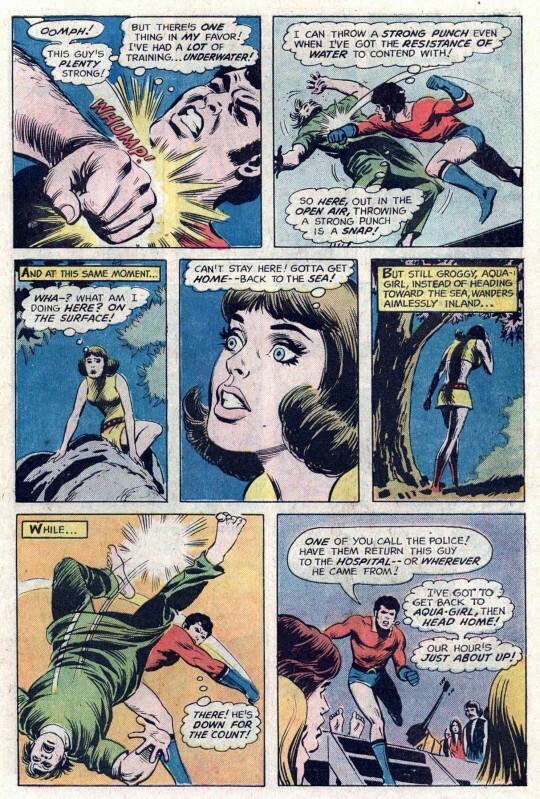 Aqualad is able to put down the crazed unfortunate (whose final fate is never disclosed) but not before Tula suffers a concussion-causing blow to the head that leaves her dazed and confused. As she and Aqualad can only remain out of water for an hour, this causes Aqualad to have to make a desperate search for her, eventually locating her and getting the both of them back to the sea’s briny embrace with only seconds to spare.